Three out of three West Coast vintners agree it’s a recession. Of these, The Ross Valley Winery (of San Anselmo, CA) was first, with TTB approval on May 6, 2008. Concannon Vineyard (of Livermore, CA) was second, with approval on June 3, 2008. TTB approved the label for Woods Lake Winery (of Woodinville, WA) on October 2, 2008. This tends to show the common, simultaneous rush to grab onto a promising new trend. It also raises the question of how US trademark law would or should handle several wineries embracing one brand name at about the same time. Update: Comment from a veteran trademark lawyer. This is an excellent example of the value of adding a trademark attorney to your legal team early. While your beverage law expert may be able to get you a TTB approval of your proposed label, that approval is very limited in scope: it doesn’t mean that you can use or register the words as trademarks to cover wine. A trademark attorney can research proposed trademarks and help you assess the risks of using or seeking to register those marks. This is a valuable service: if the search reveals prior marks in use or on the U.S. Patent and Trademark Office registry (PTO), you might want to reconsider sinking any money into labels and promotions bearing that mark. 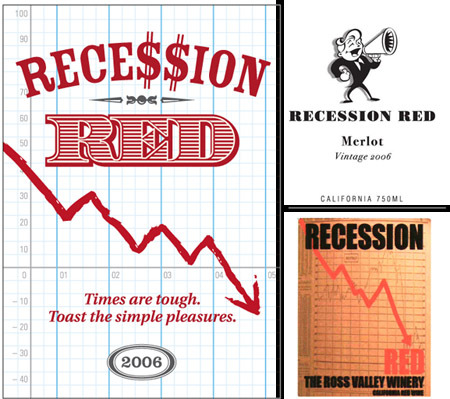 In this case, the three West coast wineries probably should have conducted trademark searches for RECESSION RED. Had they done so, they would have found that a Sea Cliff, New York company, Books & Tomatoes, Inc., filed a trademark application in March 2008 to register the mark RECESSION RED for wine. This application may cause these other wineries some difficulty. However, since the RECESSION RED application is based on the applicant’s intent to use the mark rather than their actual use, the risk posed by this application may be lower than if it was based on use of RECESSION RED in commerce. Trademark law favors the first to use a trademark in commerce: protection should be awarded to a mark that garners goodwill first based on consumer’s perceptions and associations with trademarks that they associate with a certain level of quality. Racing to be the first to use a mark is typical in industries like pharmaceuticals, but less so in wine and spirits. Pharmaceutical companies have substantial resources and business models that allow them to seek multiple trademarks, applications, labeling and promotions. They also have the resources for trademark disputes and relabeling of products if they lose those disputes. The wine and spirits industry typically does not have those resources, is more risk and dispute averse, and does not have the same need for an ultra-catchy name to distinguish their products. As a result, the wine and spirits industry clients that I have assisted are generally more deliberate in seeking new trademarks, asking my assistance and experience with the selection, vetting, and applications for their trademarks. They don’t think it is worth it to get a mark, label bottles, and get distributors ready only to have a trademark dispute derail shipments or force relabeling. Here, racing for a mark that is not very distinctive and not likely to be strong may be interesting news, but the wineries running should probably reconsider whether making it to the tape first will be worth it. In the 1980’s a Santa Barbara winery, J Carey (no longer in business) produced a wine called “Recession Red.” Dr. Carey was a local Democrat who ran unsuccessfully for local office. In response Brooks Firestone, a Republican who ran successfully for State Assembly and (later) County Supervisor, produced “Recovery White”.